Richard Meldrum, Sr. passed on Monday, October 29, 2018 at Clove Lakes Nursing Home at the age of 76. Born in Brooklyn, N.Y., Richard eventually moved to Staten Island settling in Dongan Hills. 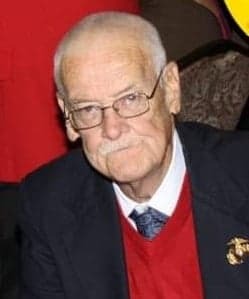 Richard was a proud veteran of the United States Marine Corps and would often make return trips to visit during various ceremonies at former bases. He was preceded in death by his late wife Madeline (nee Evich) and his sisters Catherine and Ellen. He is survived by his longtime girlfriend Martina Olsen, his sons Richard, Jr (Jennifer) and Sean (Carol) and his daughter Madeline (Edward) Jones. Richard is also survived by his brother Michael and his sisters Mildred Eckert, Ann Dennis and Elizabeth Martin. Richard will be deeply missed by his grandchildren Ryan, Jack and Rebecca and a myriad of nephews and nieces. Offer Condolence for the family of Richard Meldrum, Sr.
Sending prayers to all. Lot of good St Ann memories and long weekend trips in the Poconos with the group. We all have a lot of great St Ann memories and those 4 day weekend adult trips.